A division of Terminal Fruit & Produce Ltd.
... the secret is how hard we work to get it done. The Produce Terminal was founded on a commitment to provide consistently superior quality and service with unwavering integrity. Since 1948, this commitment to excellence has proved to be the cornerstone for the Produce Terminal's success and growth. We are now clearly recognized as a leader, involved in the distribution, merchandising and marketing of fresh fruits and vegetables, supplying the finest produce to leading wholesale and retail outlets throughout British Columbia. The Produce Terminal sources the world to offer you a wide selection of domestic and imported fruits and vegetables. We purchase daily, so you can be confident the produce we deliver is as fresh as possible. We have always believed in taking an active role with our growers and their organizations. Through the commitment and dedication of our partnership, we are able to ensure you receive the highest quality produce. We recognize the importance of supplying quality produce to our customers — our growth reflects it — our reputation depends on it. A lot has changed since we opened for business, except for our commitment to quality and service. After all, we've built our reputation on it. Located in the heart of Vancouver, our state–of–the–art, 75,000 square foot, computer–controlled refrigerated warehouse and pressurized banana ripening rooms were specifically designed to accommodate the diversity of our business. While setting new industry standards today, we continue to invest in tomorrow's technology. 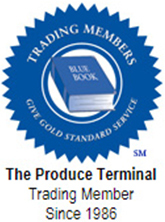 Our combination of business acumen, operating procedures, exceptional reputation for honest and fair trading policies have earned The Produce Terminal the designation as a Trading Member, a merit badge of honor awarded by Blue Book Services to the best companies in the industry. Sometimes the quality of people you deal with is as important as the quality of the product they provide.